The Carter Model AFB 4-barrel carburetors used in the 425 cubic inch engine dual 4-barrel option are very similar to single 4-barrel Carter carburetors. To aid in description, the carburetors will be referred to as front and rear carburetors. Each carburetor, of course, has a primary section (consisting of the 2 -barrelled forward half) and a secondary section (consisting of the 2-barrelled rearward half). Although fuel for idling is supplied by the primary section of both carburetors, fuel for all other operation except for hard acceleration or extreme high speeds is provided by the primary section of the rear carburetor only. Only the rear carburetor is equipped with an automatic choke and a clean air system for the choke. The rear carburetor also provides connections for the positive crankcase ventilator and the distributor vacuum advance unit. adjustment is of the idle by-pass type; all throttle valves are closed tight, so all air flow at idle is metered by a Single brass air adjustment screw in a by­pass channel. The disassembly, cleaning, inspection and assembly procedures are the same as in Section 3-G. The internal and external carburetor adjustments are also made in a similar manner, but some of the dimensions differ from those for the single 4-barrel Carter. For dual 4-barrel specifications, see page 3-2. 1. Move rear carburetor throttle lever to wide open pOSition, making sure that nothing prevents lever from actually contacting carburetor casting. 2. Unsnap front end of rear throttle rod assembly from throttle lever. While another man presses accelerator pedal firmly against floor mat, hold rear throttle in wide open pOSition and adjust rear throttle rod length so that its socket aligns with the ball on the throttle lever. Then shorten rear throttle rod two turns and snap socket on throttle lever. ball. 3. 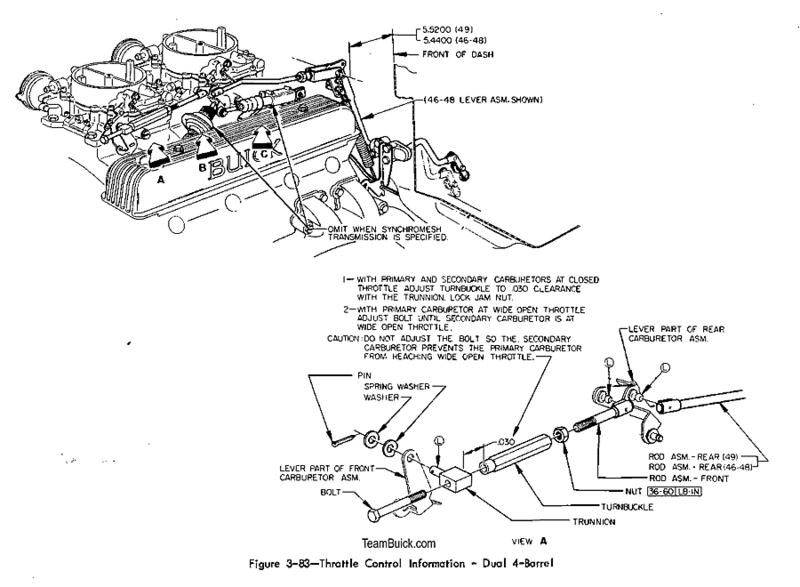 With both carburetors held at closed throttle, adjust turnbuc1tle until it just contacts trunnion of front carburetor, then back-off turnbuckle one turn and tighten lock nut. See Figure 3-83. With rear carburetor held at wide open throttle, adjust detent (down­shift) switch plunger so that it is approximately .050" inch from bottom. 1. Loosen dash pot lock nut. 2. While holding rear carburetor fully closed, rotate dash pot until plunger just touches throttle lever. Make a reference mark on dash pot, then rotate it 5 turns toward throttle lever (depressing plunger). 1. Remove air cleaner. Connect a tachometer from distributor terminal of coil to ground. 2. Start engine and run it at fast idle until upper radiator tank is hot and choke valve is wide open. 3. On automatic transmission cars, place a block in front of a front wheel and apply parking brake firmly, then shift transmission into drive. 4. Make sure that all throttle valves close fully, then set idle speed at 500 RPM by turning brass air adjustment screw in rear carburetor. 5. Turn idle mixture needles alternately to obtain highest tachometer reading. 6. Each time an improved mixture setting increases the idle speed, the air adjustment screw must be turned inward to decrease the idle speed to 500 RPM. Since this is strictly an air adjustment, this throws-off the idle mixture. For this reason, always adjust idle mixture needles last. 7. Press a finger on the brass valve of each idle compensator to see if idle speed drops because compensator was open. If speed drops, readjust idle, making sure compensator remains closed.